If you, as many organizations have, have introduced DevOps, Agile, or some other software development methodology for increased application development and deployment, you may be running into a testing bottleneck. These processes make production faster, but don’t change the way you perform QA on your end results. This is where continuous testing comes in. 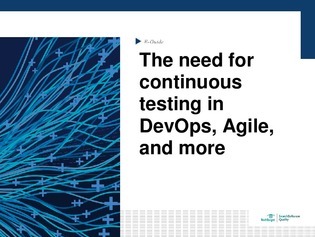 In this E-Guide, explore what exactly continuous testing means, why it’s necessary for those working in Agile and DevOps culture, and how you can start implementing it today.